2014 Lexus IS Pros and Cons: Why (Not) This Car? The world's largest auto maker isn't used to being in last place. But, even after two attempts that's where its Lexus line still ranks (save struggling Volvo) within the compact luxury sedan segment defined by the BMW 3-Series. Hobbled by insufficiently athletic handling, a tight rear seat, and the brand's anti-sport identity, the Lexus IS connected with few buyers last year. For the 2014 model year, the IS has been thoroughly revised. Will the new car prove to be the charm, or the third strike? Why the 2014 Lexus IS? I like the Lexus IS's new exterior a lot. You may hate it. What you're not likely to be is indifferent. Which I also like. With its first redesign, for the 2006 model year, the Lexus IS adopted the then-new "L-finesse" design language in an attempt to appear more distinctive and desirable. Perhaps because the new curves combined with new high-waisted proportions to make the car appear chunky, the new look didn't help sales much. With the 2014 IS, the exterior styling has been amped up another level or three. While a large, oft-reviled new "spindle" grille (referencing Toyota's start as a loom maker) might be the most obvious change, it's far from the only one worth mentioning. Aided by a 2.7-inch wheelbase stretch and crisper lines, the new sedan appears more sleek and athletic, while still appearing (and being) reasonably compact (unlike the four-inch-longer Infiniti G37/Q50). Unlike with the BMW 3-Series and upcoming Infiniti Q50, the largest available wheels are 18s and not 19s, but the car has been designed to look right with this size wheel. With some past and present Toyota's, bizarre details have been tacked onto what would otherwise be a boringly generic design. Lexus have generally been more tasteful, but short on excitement. Though considerably more dramatic than those of the previous Lexus IS, the new exterior's lines and surfaces also flow together to form a coherent whole. I especially like how a line from the rocker panel curves upward to meet the descending rear pillar, and how the virtual point this forms is echoed in the side window outline. Some reviewers see these details as overly contrived, and many buyers similarly will prefer competitors' cleaner, safer designs. But anyone bored with these safer designs will appreciate how well the new IS's exterior integrates some bold details. They might not even mind the off-planet face. And you? Lexus originally made a name for itself by providing an unusually smooth, quiet ride. In fact, they did such a good job of insulating the driver from the outside world that they've had a very difficult time pitching the compact IS and midsize GS as driver's cars. Now, they might have sought to shatter this stereotype by turning out a truly raw car, or at least a hard-edged one. But they haven't. Even with the F Sport package's sport suspension, the new Lexus IS provides the smoothest, most composed ride you'll find in the segment. Though the IS 350 F Sport's adaptive dampers didn't care for one stretch of especially uneven pavement along the test route (the car jiggled enough that I momentarily wondered if a tire had gone flat), they generally do a fine job of firming up when more control is required, and going with the flow of the road surface when it's not. While BMW has considerably softened up the 3-Series in a bid to appeal to buyers with little interest in driving (i.e. those who've traditionally bought Lexus), they've gone too far. The compact Bavarian's body control is now subpar over uneven roads even with the top spec suspension. The Cadillac ATS, on the other hand, has an aggressively firm suspension that never quite loosens up. Though the ATS's ride is far from punishing, you will feel each bump, if briefly--much like that of past BMWs. Among the three, the new Lexus IS best combines comfort and control. Noise levels are fairly low in all three cars. With the Lexus, though, I found the amount of wind buffeting uncomfortable with the window more than halfway down. Following the Germans' lead, many car makers have been fitting firmer and firmer seats. Cadillac might have once been known for seats you could sink deep into, but those in the ATS are the opposite, with too little give and contours that are far from form-fitting. No fear, Lexus hasn't done the same with the IS. Even the more heavily bolstered seats that are part of the F Sport package lack hard points, which helps them provide a slop-free fit for a wide range of body types. (Oddly, you'll find seats similar to these in some Chrysler people haulers.) Personally, I wouldn't mind a little firmer support, but then I also prefer a firm mattress. Notably, the lumbar support in the Lexus IS is only two-way and the spread of the side bolsters is not adjustable. For four-way lumbar support and adjustable side bolsters (plus somewhat firmer support) you need to step up to the larger Lexus GS. An IS 350 with the F Sport Package lists for $43,980. Nav adds another $2,085 and Variable Gear Ratio Steering another $400, for a total of $46,465. The tested car also had a blind spot monitor, which brought the total to $46,815. It's not clear if this option is required by one of the others. For sake of comparison, I'll ignore it. Equip a BMW 335i similarly, and it lists for a lofty $54,045. A Cadillac ATS Premium 3.6 slots in well below the BMW, but above the Lexus, at $49,240. (If you can live without adaptive dampers, a comparably equipped ATS Performance lists for $47,835.) 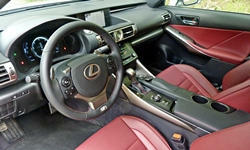 Either car includes more features than the Lexus in these prices, most notably leather upholstery. But even after adjusting for these features the Lexus is a few hundred dollars below the Cadillac (they're close) and about $6,000 less than the BMW. And if you don't care for at least some of these features, then the price advantage of the Lexus widens. Even with the big six, brute acceleration isn't the Lexus IS 350's forte. Though the new car can hang with the Cadillac ATS 3.6, you'll experience considerably more shove in an Audi S4 or BMW 335i. Rather, the IS 350 distinguishes with smooth, seamless acceleration. At this price point you won't find a more refined powertrain. An eight-speed transmission new for 2014 (and only offered in the rear-wheel-drive IS 350, not with AWD or the IS 250) lends an assist. Though this transmission promptly selects the optimal gear for the circumstances (aided by new G-force-based artificial intelligence), and fully locks the torque converter in every gear save first, shifts are always smooth, and quite often aren't even detectable. The F Sport package adds rev-matching with downshifts. The 3.5-liter V6 engine surges to a 6,600 rpm red line with a song that is at once refined and exciting. It's far from silent, but any noises that might prove objectionable have been tuned out. The V6s in the Cadillac and especially in the Infiniti sound unrefined in comparison. Why Not the 2014 Lexus IS? If you can get a feature on a competing car, you can most likely get it on the Lexus IS, with one notable exception. You've never been able to get a manual transmission in the IS 350. For 2014, you can't get one with the IS 250, either. Audi, BMW, and Cadillac all continue to offer a manual transmission with at least one reasonably powerful engine. If you're among the few remaining buyers in this segment who insist on a clutch no matter how skillful the offered automatic, the Lexus is out of the running. I've dinged the Cadillac ATS for its tiny trunk. The Lexus IS 350's trunk is just a bit larger, 10.8 vs. 10.2 cubic feet, so it gets dinged as well. The BMW 3-Series has a much larger, 17-cubic-foot trunk. One helpful change from previous generations of the Lexus IS, and from the Infiniti G37/Q50: the rear seat now folds (with a 60/40 split) to expand the trunk. Toyota aimed to make the new 2014 Lexus IS 350 F Sport the most fun to drive car in the segment. To paraphrase Lexus's words, this means that it should immediately and precisely respond to driver inputs in an engaging and informative way, that it should satisfy what a driver wants. Well, my wants weren't satisfied. My issue isn't with the 2014 IS 350 F Sport's ability. A stiffer body structure combined with redesigned steering and suspension systems deliver precise, stable handling. (This said, an IS 250 AWD with the standard suspension felt much less precise and controlled.) Driving the 2013 IS 350 back-to-back with the 2014, I was shocked by how rubbery the old car's steering felt and how sloppily its suspension behaved. (In the 2013's defense, it was a non-sport AWD model; Lexus handicapped its own car.) The 2014's steering feels far more direct and linear. With the IS 350 RWD F Sport (but no other variants) you can add Variable Gear Ratio Steering (VGRS) plus power steering column adjustments for only $400. With this option, the car felt a little more lively. I am not an expert driver. I can imagine that if you drive the new Lexus IS in a thoroughly expert fashion, then it will react in a thoroughly proper way. Do things that aren't entirely proper, because you lack the knowledge and skills or to add some extra spice to curves, and the car will at best ignore you, at worst punish you. In short, the new Lexus IS does what it wants, which might be what you should want, but not what you actually want. The best cars are not only more dynamic and engaging. They make me feel like a better driver. The new Lexus IS does not. The Cadillac ATS, while still more insulated than my ideal, comes much closer, with more communicative steering, a more agile feel, and a chassis that can be rotated by your right pedal as well as the steering wheel. The VDIM system can be turned off, and turning it off might well fix the problem. But driving a powerful rear-wheel-drive car with no stability control can be tricky, which is why Lexus instructed even an experienced group of auto writers not to turn it off. BMW and Cadillac offer sport settings for their stability control systems that significantly raise the threshholds at which they kick in, and when they do kick in they don't affect the character of the car. Compared to the driving position in the 2013 Lexus IS, that in the 2014 is a couple centimeters lower, to provide a sportier feel. I found the lowest position too low, and raised the seat a bit. (Raise it a bit more and the windshield header starts to intrude.) This done, it still seemed like I was sitting much lower in the 2014 than in the 2013. While I wouldn't like to be higher above the road, I would like to be higher above the instrument panel. Unfortunately, in ISes old and new the base of the windshield is a little high, mildly constricting the view forward. In contrast, the driving position in the Cadillac ATS (which strongly resembles that in a Mercedes C-Class) is nearly ideal. Adding all-wheel-drive to the Lexus IS adds another issue, a large hump beneath the driver's right calf. Some drivers might find they have to adjust how they sit to avoid this hump. Beyond these two issues, the driving position in the IS is quite good, with all controls easy to reach and the great majority of them easy to use. Some people aren't fans of the "remote touch" mouse-like controller for the nav system, but I'm generally okay with it. The 2014 IS 350 manages 19 mpg in the EPA city test, and 28 in the highway test. While these figures tie those for the Cadillac ATS 3.6, they're short of the 23/33 achieved by the BMW 335i. Also, with both the BMW and the Cadillac you can step down to more efficient turbocharged four-cylinder engines. With the new IS, your only other engine option is a small V6, and its fuel economy is only a couple mpg better than that of the big V6 (21/30). The BMW has a further advantage: you can set the steering and suspension to "Sport" without forcing the transmission to hold a lower gear. In the 2014 IS 350 F Sport, the sport modes are "all or nothing." Select one to firm up the steering and suspension, and the transmission won't shift beyond sixth gear, reducing fuel economy. Lexus should follow Audi's lead and offer an "Individual" mode, where each system (powertrain, steering, suspension, etc.) can be set separately. Inside, the new Lexus IS also goes its own way, with a rectilinear, strongly horizontal instrument panel that, for me, warmly recalls the Japanese designs of my youth. The F Sport package includes an LCD tach plus digital speedometer styled like that in the LFA supercar. The tach motors to the right when you desire to view the trip computer (in a second LCD just behind the one that moves). The non-F'd car has more conventional instruments, with a smaller multi-function display between an analog tach and speedometer. Materials are mostly worthy of the Lexus IS's price, though some switches could have a more solid, less hollow feel. This said, the restricted availability of leather seating surfaces could be controversial. The car comes with seats upholstered in "NuLuxe," a synthetic leather-like material with a softer feel and richer hand than the leatherette in a BMW or Cadillac. You can get real leather as part of the Luxury Package, but the Luxury Package cannot be ordered with the F Sport. So, if you get the F Sport, you get NuLuxe. One benefit: the padded bolsters provided by injecting foam into a NuLuxe shell. According to Lexus, this enables the seats to feel soft while providing proper support. Leather-upholstered bolsters would be harder, especially as they age. Toyota didn't stretch the wheelbase of the new Lexus IS by 2.7 inches just to lend the car a more slender body. Rather, the intent was to eliminate the previous car's primary shortcoming, a tight rear seat. Virtually all of the wheelbase stretch has been translated into additional legroom. Consequently, the new Lexus IS has nearly as much room in its back seat as the recently up-sized BMW 3-Series, and considerably more than in the Cadillac ATS. The rear seat cushion is a little lower than in the BMW, and consequently isn't quite as comfortable. It's also not as wide, so three in back would prove more of a pinch. But anyone seeking a compact sport sedan with enough space in back for their adult friends can now include the Lexus IS in their consideration set. Adding insult to injury, BMW and Cadillac aren't the only ones capable of properly calibrating a performance-oriented stability control system. Toyota engineered an excellent stability control system, complete with an appropriately-tuned sport mode, for the Scion FR-S. Replace VDIM with a similar system in the 2014 Lexus IS, and you'd have a car much more likely to deliver the promised driving experience. Lexus provided insured cars along with breakfast and lunch at an event for media. Elizabeth Duperon at Suburban Cadillac of Ann Arbor (734-327-1792) provided a test drive in the ATS so I could refresh my memory of that car. 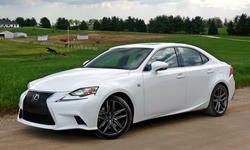 2014 Lexus IS pros and cons, according to Michael Karesh: the best reasons for buying (or not buying) the 2014 Lexus IS. Join TrueDelta to post your own impressions.